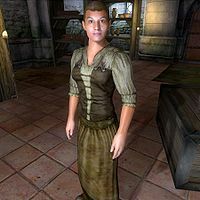 Bronsila Kvinchal is an Imperial commoner living with her brothers, Kastav and Vlanarus, in a shack in the Imperial City's Waterfront District; however tensions among the three are high. Bronsila is employed as a dockworker by the Imperial Trading Company. From 10pm to 6am, she sleeps in her bed in the Kvinchal's Shack then spends two hours pottering around before heading to work in the easternmost of the two warehouses on the docks. At 5pm, she heads back to the shacks and walks around two hours. At 7pm, Bronsila heads home and wanders around her shack until it's time for bed. The two exceptions are when Hieronymus Lex is searching the Waterfront during the Misdirection quest; and during Light the Dragonfires during the attack on the city. In both cases, Bronsila stays at home to avoid breaking curfew. Bronsila will introduce herself, and comment about her brother, when you first speak with her: "I'm Bronsila Kvinchal. And I'm so sick of that Vlanarus, I could scream." When asked about the city, she will complain on how bossy her brother is: "I've worked on the docks as long as Vlanarus, but he thinks he's the expert. He's always looking over my shoulder, do it this way, do it that way." Bronsila wears a lower-class outfit consisting of a shirt with suspenders, belted braies, and a pair of clogs. She carries the key to the Kvinchal shack, as well as a few pieces of gold. An omission in her schedule means that she never eats, but the scripts associated with the quest An Unexpected Voyage indicate that she was supposed to eat at The Bloated Float Inn at some point.